We have an ensemble of great actors whose voice talents make this film what it is, a great flick. 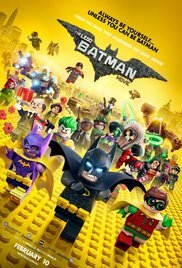 They include: Batman (Will Arnett), Robin (Michael Cera), Barbara Gordon/Batgirl (Rosario Dawson), Alfred (Ralph Fiennes), Joker (Zack Galifianakis), Harley Quinn (Jenny Slate), Voldemort (Eddie Izzard), Sauron (Jemaine Clement), Superman (Channing Tatum), Green Lantern (Jonah Hill), The Flash (Adam Devine) and many, many more. They bring a great deal of laughs and inside jokes that only adults will pick up on, and of course, they also bring humor and action for the kids to enjoy. Lego batman revolves around the story of the Dark Knight, who is the savior of Gotham. The Dark Knight thinks he is the best at everything and never shows humility. He likes the fame that comes with being the hero. He is good at what he does, but he does it alone. His butler, Alfred, is the only one he comes home to at the end of the day. He tends to not involve others in his actions, and his isolation plays out as a sad story throughout the movie. But, he grows as a character and eventually starts his own family and works with others. His old nemesis, The Joker, makes an appearance, along with many other villains. Some of the villains are from old Batman movies but some are not even from the Batman world, which makes the movie really fun. The Joker is by far my favorite and Zack Galifianakis did an amazing job with him. The voice of Batman was a perfect choice as well. This flick was enjoyable and I had a good amount of laughs. It's great family fun that you shouldn't miss out on. So, take your kids and see Batman take down some baddies and see him grow from being a loner to someone who trusts others and lets them join him in the good fight.